Oh boy, oh boy, this week’s listicle is going to bore some of you completely out of your minds but I’m excited! Can you tell? I love weddings. Love them. Seriously. I simply can’t believe Stasha handed me the opportunity of showcasing my wedding pictures on a silver platter! Aren’t you thrilled! I did write an actual list, but you get wedding pictures in the mix, lucky you! (Seriously, Stasha, what were you thinking? You must have known some of us would go overboard and our readers would be groaning!) So, ten things wedding… ta-da!!! 1. I attended both my Mom’s weddings. My parents were married when I was eight, they got married in Vegas because an immigration officer told them to (long story, fodder for another post). My dad didn’t want to marry my mom, not because he didn’t love her, because he did, more than life itself, but because he was twenty-eight years older than her and wanted her to be free to leave him at any time. She never did. 2. My Mom got married again last year, to a very nice guy. She had a church wedding with a full catholic mass, she had a beautiful white dress and long veil. 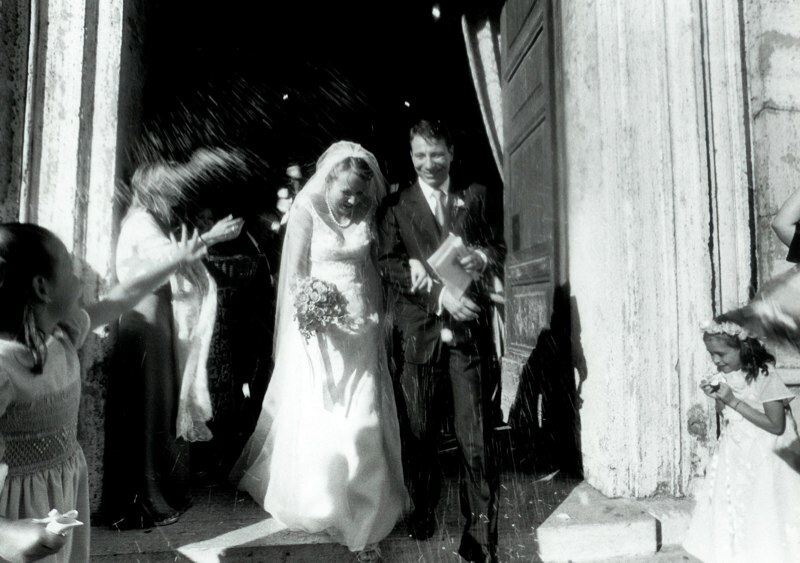 She finally had the wedding every girl dreams of that she couldn’t have with my Dad (who was divorced and couldn’t, obviously, remarry in the Catholic Church). 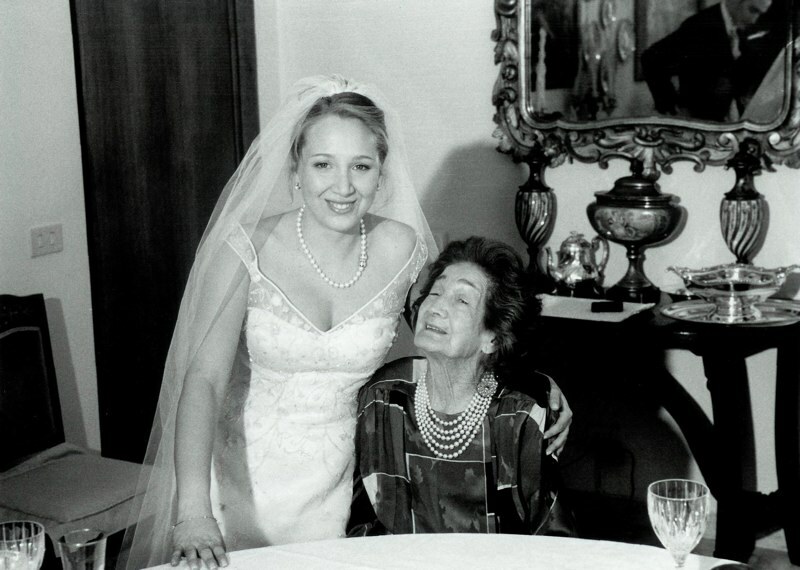 My Grandma and me. You can also see my brother reflected in the mirror, looking like a 1920’s movie star. 3. I had the absolutely most perfect wedding (for me) courtesy of my wonderful parents. 4. I’ve often wished I was British so I could have an excuse to wear fabulously ridiculous hats to weddings. 5. I cry at weddings. I also sneak into church when I see a wedding is about to happen, I can usually be found in the back pew, dabbing at my eyes with a hanky. I normally leave before the end of mass, but I like to at least see the bride’s entrance. 6. A friend of mine got married in a gorgeous red gown and looked amazing, I kind of wished I had thought to wear an unconventional color at my wedding, but I’m way too traditional (and I didn’t want to give my dad a heart attack). 7. I didn’t watch William and Kate’s wedding for no reason other than I got distracted when it happened, although I still remember Charles and Diana’s wedding (I was nine). 8. I hate typical Italian weddings, where you go to church in the morning and then have lunch, which usually starts late because the happy couple is off taking pictures and then lasts well into the evening. I went to a wedding once where we were at church at 11am, sat down to lunch at 2pm and finally got up from the table at 7pm. I wanted to shoot myself. 9. 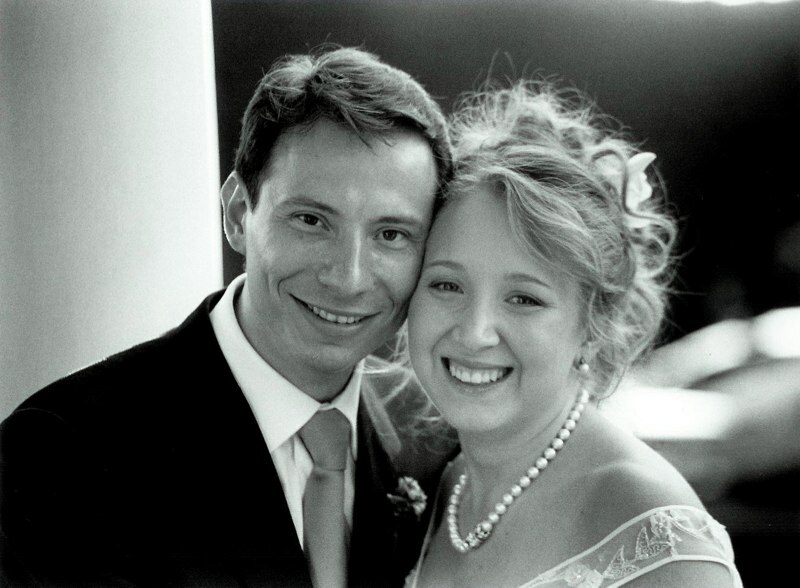 I love looking through other people’s wedding albums, if only to mentally laugh at all the out of date fashions. 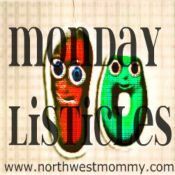 This entry was posted in Uncategorized and tagged all about me, marriage, meme, monday listicles, photos, wedding by bonnybard. Bookmark the permalink. I have also always wanted to wear fabulous hats to weddings like the British do. Lovely wedding photos! I know, where else would we get to wear hats like that out in public! I couldn’t concentrate on the text, I was too busy looking at your gorgeous photos! Oh my, the dress and that veil. Gorgeous!! Lovely photos! Mine were before digital so I didn’t have time to dig them out! HA! Mine are pretty digital too, my (slightly-photo-obsessed) husband conveniently scanned them years ago! Endless weddings…. yes, extra shoes are a definite must!! Oh my goodness, I die….Your Dress!!! Perfection. I was one of the those trendy ahead of my time who had some colour in her wedding gown. Mine was baby blue. not much…you can’t even really tell in the photos that are not close up. 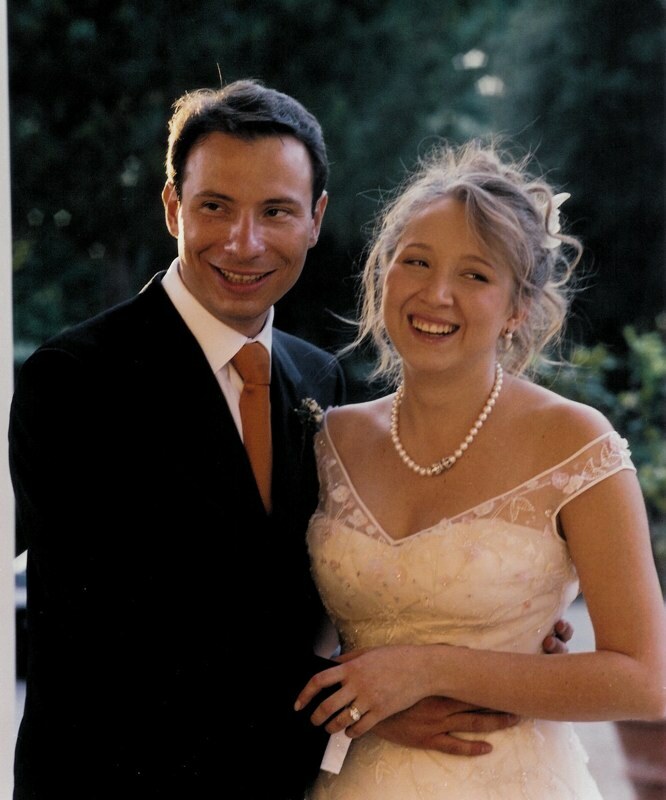 I’ve only been to one Italian wedding…..it was really fabulous, they know how to do it up right, but I swear I still have indigestion almost 20 years later. Ha, ha, thanks! Colored dresses are beautiful! I know, I’m nosy too! Oh my, love your photos, dress, vail, handsome brother ( I cannot say I like your handsome husband cause it is politically incorrect). Love the story of your mom and everything about your list!! I love looking at other peoples photos too!! Awesome list my friend. Thanks! Great subject as usual! I love you! I love your parents amazing love story. I love that you love wedding and sneak into churches. Please can I move to Italy and be your best friend? The spare bedroom is all ready for you! I too have wished to be invited to an English wedding just for the sake of the hats! 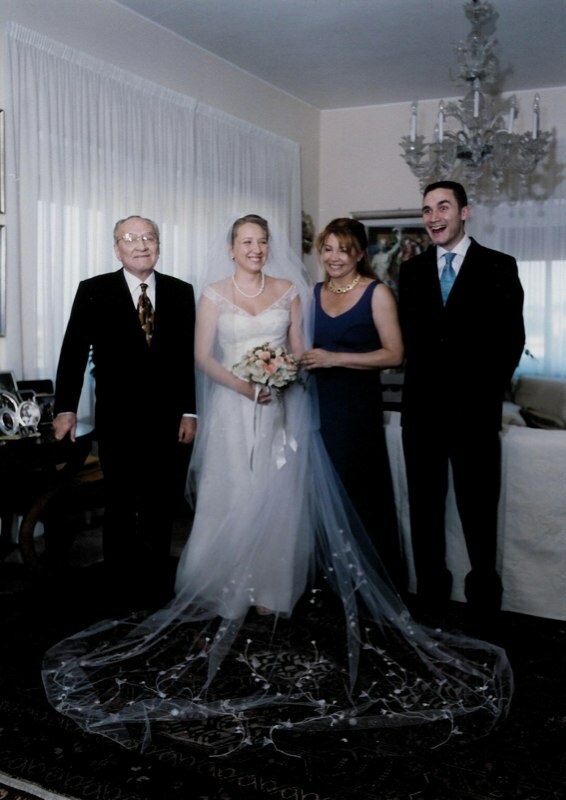 What lovely photos and the priest was right, it is about the marriage. OMG, I LOVE your dress. That train is beautiful!!! Nice post, beautiful pics! Thank you! I couldn’t resist the chance to post them! Scary, yes, but kind of cool…! I loved seeing all your wedding photos! Stasha did give everyone a good reason to show them off!